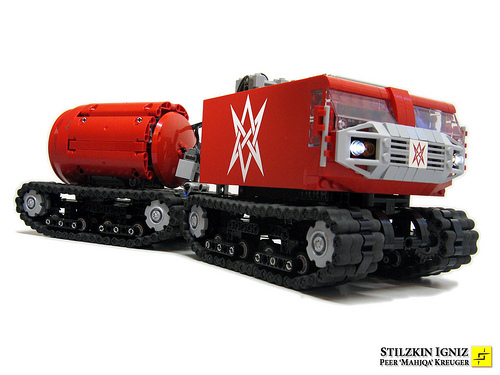 This tracked transport by Peer Kreuger (mahjqa) incorporates a Power Functions motor to journey straight over boulders and trees — well, at least very large pebbles and tall grass blades. I’m especially impressed with the treads. Built from individual Technic elements, they don’t just use the LEGO treads that come in sets. I’m mostly astounded at how many of those tiny little rubber flexers he got for the treads. Maybe there are a lot more sets that have them than I think but there must be hundreds of them in those two vehicles. They’re also pretty fantastically built. I had the privilage to see it for real last October in Zwolle at LEGOWORLD and I must say it is an impressive piece of work. Especially the inside and construction.